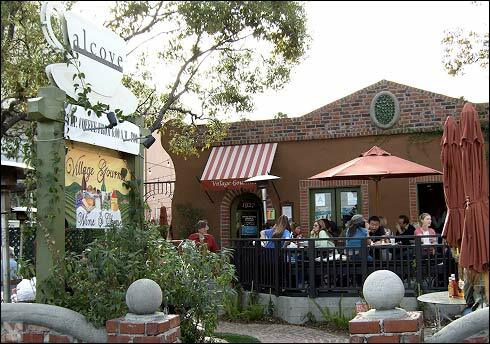 The Alcove Café & Bakery in Los Feliz is a great spot for lunch or dinner. The Big Bar, which opened last October is a great addition. Though there is some indoor seating, most folks opt for the outdoor patio for salads, sandwiches, and desserts. Ah, those desserts! The establishment is one that has you order and pay at the counter and let a courteous staff member bring you your order when it’s ready. 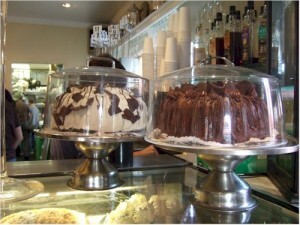 No problem, but while you wait for your turn to order you will see a delectable assortment of desserts behind that glass counter! Make sure to save room! No longer missing from the Alcove is the opportunity to imbibe along with that meal. The Alcove added Big Bar to the mix last fall and patrons are happily having a drink with that meal, thank you very much! How nice to have a glass of wine or a beer with that tasty lamb burger, one of my favorite Alcove entrees. Big Bar is also open to those who’d simply like to enjoy a drink sans meal. Big Bar can be reached from its own separate entrance from the Alcove patio or directly from inside the Alcove itself via a wide passageway. Big Bar has the feeling of being a part of the Alcove, but also its own thing entirely. The bar has the same relaxed vibe as the Alcove restaurant – come as you are and enjoy yourself. It’s a perfect addition to Los Feliz. The Big Bar serves a nice selection of beer and wine plus cocktails that tend towards a twist on the classics. You’ll find some interesting mixes like the Los Angeles Cocktail, New Brunswick and the Vie Rose all priced at $12. During happy hour, 4 - 7 p.m. on weekdays, select drinks are $8, well drinks are $7 and $5 will get you a draft beer. You’re bound to find a special or two during happy hour as well. Regardless of when you arrive, you can choose to eat, drink or do both. Big Bar food items are printed on one side of the menu while the Alcove menu is on the opposite side. 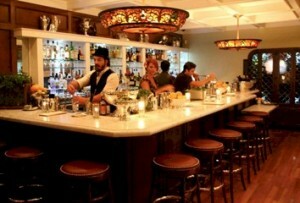 Patrons can order from either menu at the Alcove or Big Bar making it easy to get what you want all at one time. If you haven’t been to the Alcove in a while, you might want to try a bloody Mary with Sunday brunch. Not hungry but would like to enjoy a drink out on the patio? Give the Big Bar a try- you won’t be disappointed.